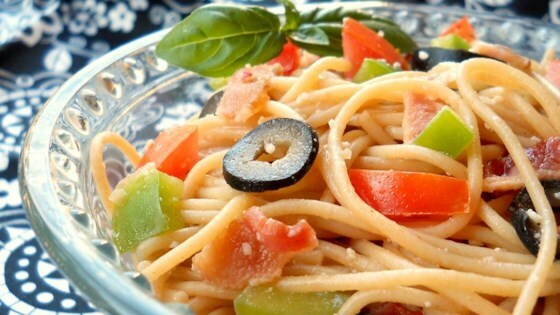 "Cold Italian spaghetti salad. Great after it's been in the refrigerator overnight." Way too much onion and dressing in this recipe. However, the freshness of the vegetables was very appealing. I served this as at a party of mine and it was a huge hit! I prepared it the night before and let it sit in the fridge overnight as suggested. This salad was awesome. I used the McCormic Salad supreme seasoning (in the spice aisle) as another reader suggested and it was great. Thanks Kari.